They said it couldn't be done. They said there was no way we could get this far into a bracket this dumb. Well we showed them, didn't we? We are just one round away from once and for all crowning The Purplest One. We have two incredibly purple competitors left. Let's look at last week's results. The winners are in purple. So here we are. 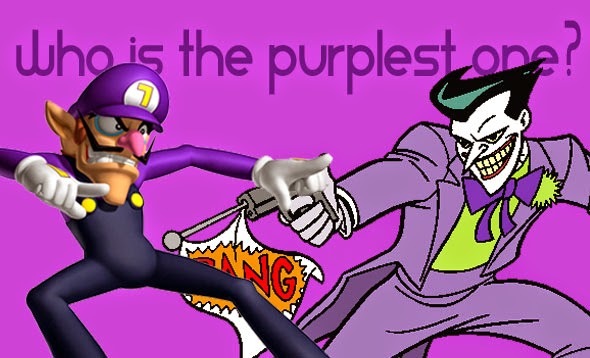 We are down to a battle between Waluigi and the Joker. Both are incredibly purple. They are eccentric. They are evil. They wear mostly purple. It doesn't get more purple than that. The rest is up to you. You can vote here. The bracket can be found here. Keep up with the results by following us on Facebook and twitter. Listen to our most recent award-giving podcast here and you can subscribe on iTunes, Stitcher, and Soundcloud.